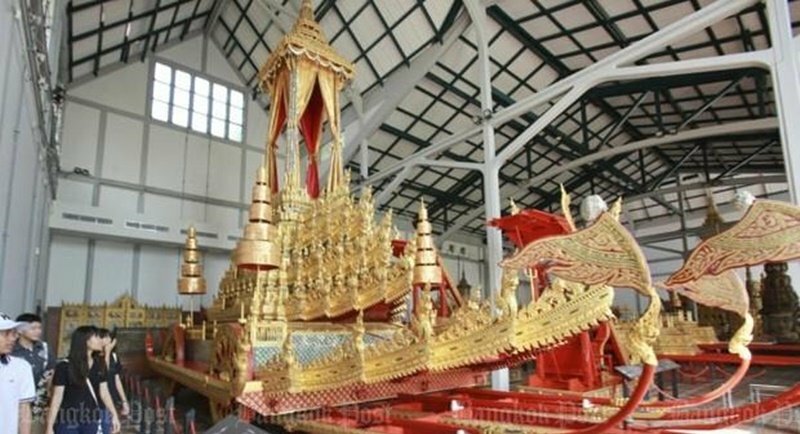 BANGKOK: The government is finalising preparations to handle mourners who will flock to pay their respects before His Majesty the King’s body in the Grand Palace starting this Saturday (Oct 29). Speaking after yesterday’s cabinet meeting, Prime Minister Prayut Chan-o-cha said the government’s situation monitoring command centre would meet today (Oct 26) to integrate the action plans of all state agencies to deal with and assist mourners. Starting this Saturday, mourners will be allowed to pay their respects before the late monarch’s urn from 9am to 4pm in the Dusit Maha Prasat Throne Hall inside the Grand Palace. Access will be allowed after the 15-day merit-making ceremony is completed this Friday (Oct 28). Some 10,000 mourners will be allowed in daily, in groups of one hundred at a time. It is important for agencies to pool their resources to deal with issues such as rubbish management, accommodation, food and healthcare for mourners, and security, Gen Prayut said. He revealed that His Royal Highness Crown Prince Maha Vajiralongkorn has instructed his personnel to provide food to mourners every day. “The public are grateful for the Crown Prince’s kindness,” Gen Prayut said. Gen Prayut also said a committee he will chair has been set up to oversee preparations for His Majesty the King’s cremation. Meanwhile, people in other provinces are holding activities to express their respects to the late King. More than 3,000 people went to Thaksin Ratchaniwet Palace in Narathiwat yesterday to sign condolence books for the late monarch. Wichai Chaimongkol, the director of the palace, said the Royal Household Bureau has allowed the public access to the palace to sign condolence books from 9am to 4.30pm from yesterday until Nov 25. Narathiwat Governor Sitthichai Sakda said the palace was built in 1973 and served as a royal residence when His Majesty the King visited people in the deep South. In Chiang Mai, Pornchai Jitnawasathian, president of the Chiang Mai Tourism Council, said that 30 organisations and Chiang Mai residents will hold activities, including candlelight vigils, as a tribute to His Majesty the King at Tha Phae Gate from Saturday to Monday (Oct 31). Meanwhile, Indonesian President Joko Widodo paid respects to His Majesty the late King yesterday at the Dusit Maha Prasat Throne Hall and later wrote a message in the condolences book in the Red Room of the Royal Household Bureau. Mr Widodo was on a one-day visit to Thailand to pay his respects to the late King. Others dignitaries that have visited to pay their respects include the prime minister and president of Singapore, Lao Prime Minister Thongloun Sisoulith, Malaysian Prime Minister Najib Razak, the King of Malaysia, the sultan of Brunei and Cambodian Prime Minister Hun Sen. According to Kyodo, Japanese Emperor Akihito has also sent a message of condolence to Thailand over the passing of the King. The telegram, dated Monday (Oct 24), was addressed to His Royal Highness Crown Prince Maha Vajiralongkorn, the imperial household said. After the King passed away on Oct 13, the Japanese emperor and his wife Empress Michiko began a three-day mourning period, beginning that same evening. Japan’s imperial couple maintained close ties with the Thai royal family during the King’s reign. Starting Saturday, the Ministry of Education will open three service centres where people coming from other provinces to pay respects to the body of His Majesty can get free food and drink, dye their clothes black and use toilets for free. The three centres will be set up at Satriwithaya School, Wat Rajabopit School and Dusitaram Secondary School where free shuttle bus rides to Sanam Luang will also be provided. The centre at Satriwithaya School will be hosted by the Office of Basic Education Commission. The one at Wat Rajabopit School will be hosted by the Office of the Non-Formal and Informal Education, while the one at Dusitaram Secondary School will be hosted by the Office of the Vocational Education Commission. Chaipreuk Sereerak, Education Ministry permanent secretary, said the ministry wants to relocate its current service centre at Sanam Luang to help the Bangkok Metropolitan Administration handle 200 tonnes of waste per day in the area. “At present, thousands of food boxes and plastic bottles are left abandoned at Sanam Luang after visitors leave, posing a headache for city cleaners. Therefore, we want to help,” Mr Chaipreuk said. The ministry has also received complaints about the chemical smell from its free clothes-dyeing service at Sanam Luang, he added. Mr Chaipreuk said the ministry’s service centre at Sanam Luang can now support around 4,000 people a day, so he expected the new centres to be able to handle up to 5,000 a day. “If our resources at all three centres are still not enough, we might set up one more at Wat Saket School,” Mr Chaipreuk said.